The internet has sort of taken over our lives, we all feel the need to share our lives online for our followers, family and friends. I myself don't see a problem with sharing parts of my life and being open about what is happening, some people may feel it is oversharing but I don't really mind at all, to a certain extent. 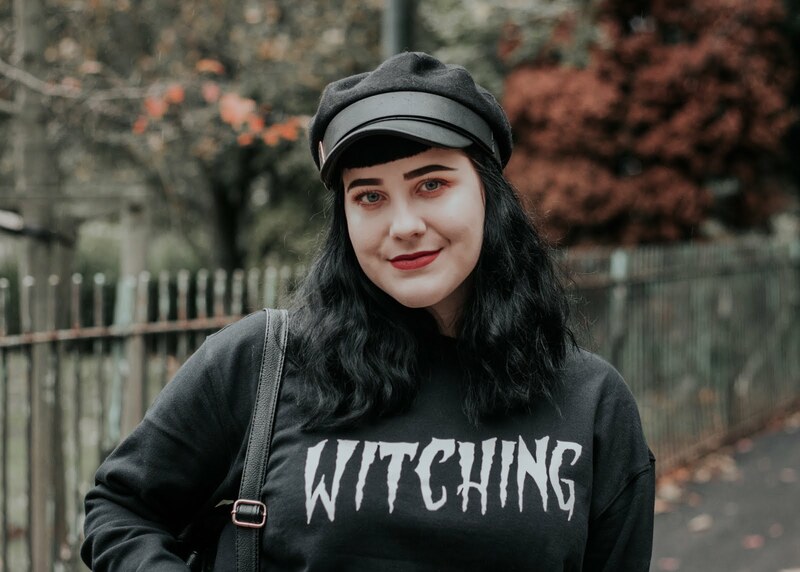 A big part of having a blog (and Youtube) comes with building the relationship with followers and giving them a bit of an insight into your daily life, I find with YouTubers who vlog for the audience it sort of feels like you're friends with the person who is vlogging and that you actually know the person who is creating this content. Sometimes things may happen in our lives that we don't want to share on the internet and we have valid reasons not to, viewers and readers may notice slight changes in our content or how we are, we all share so much online already that people may comment on changes but this doesn't mean we owe them an explanation. And I mean this in the least rude way possible, I mean this in a way that we are protecting ourselves, our private lives and sometimes things happen where we are not the only person involved, so airing dirty laundry online probably isn't the best thing to do out of respect for ourselves and anyone involved. Personally, I do share a lot on Twitter to do with MH but I draw a line on certain things. My followers know my struggles to a certain extent but I prefer not to go into details, I'm happy to share with others and also listen to what others have to say. But if anyone doesn't like what I say or disagrees with something I don't have to explain myself if I don't want to, this is the internet and in the grand scheme of things I don't owe anyone anything (like I mentioned, not in a rude way) so I will say what I want and as long as I'm not spreading hate or anything along those lines, it will be fine. I'm just sharing an experience. Thankfully, for me and for others building a following and making friends online comes with amazing support from people! 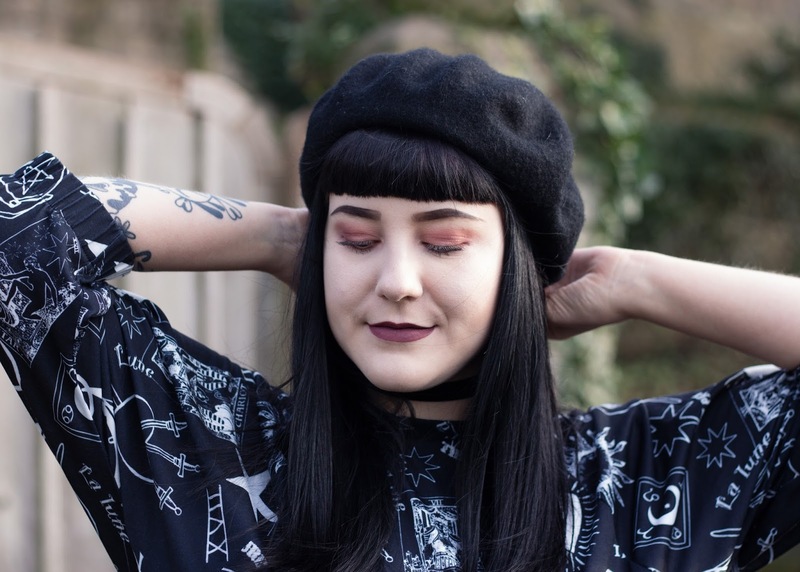 So sharing bits and bobs and choosing not to share is absolutely fine, for me I have met some amazing people through blogging and we all support eachother no matter what we choose to share! 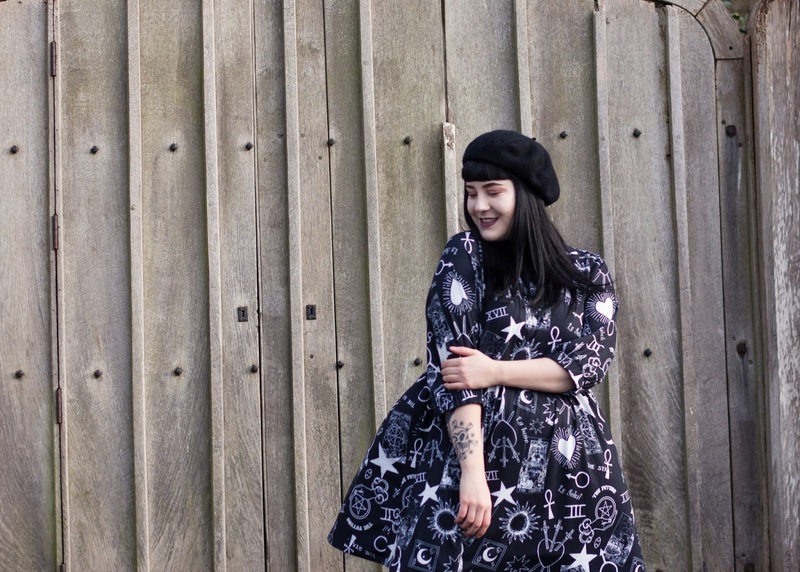 Lately I've been wanting to embrace my favourite alternative style but also the little quirks I have in my style too, and this dress says it all! 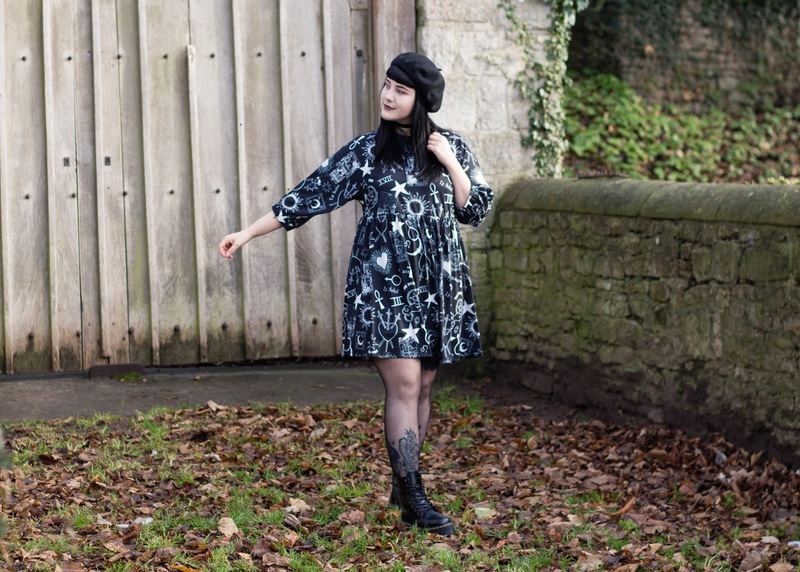 I actually intended on searching for a plain black smock dress and this one popped up and I instantly fell in love. 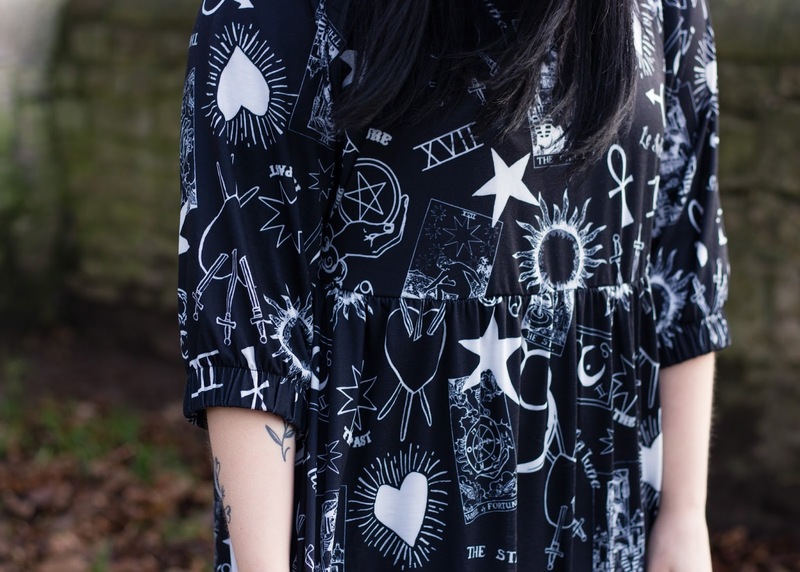 This dress has a tarot card themed print on it, which is unlike any item of clothing I've ever seen, like I mentioned it has different tarot cards dotted all over, hearts and daggers, stars and so many other things that tie in with this theme. 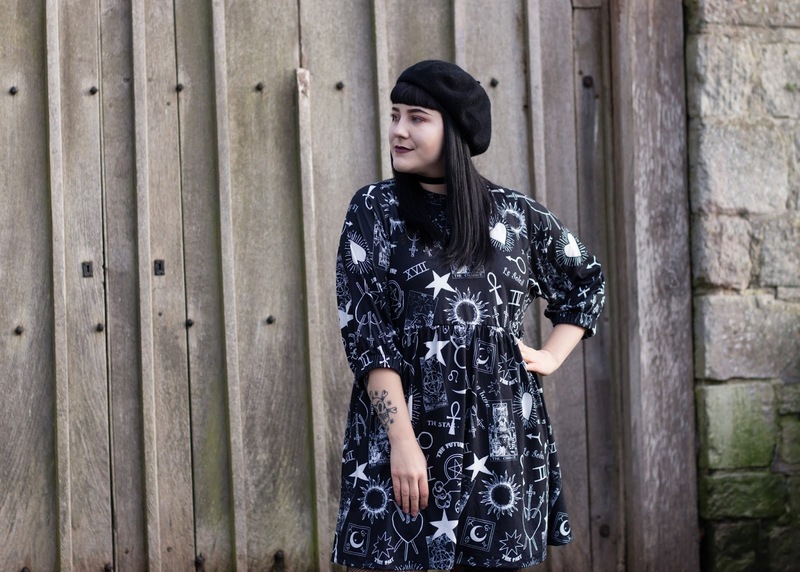 Smock dresses are something I lean toward as the loose fit means you can't see many of my lumps and bumps, I also like the baggy three quarter length sleeves that are elasticated at the ends too. I've kept it simple when styling this dress as lets be honest, it does all the talking. 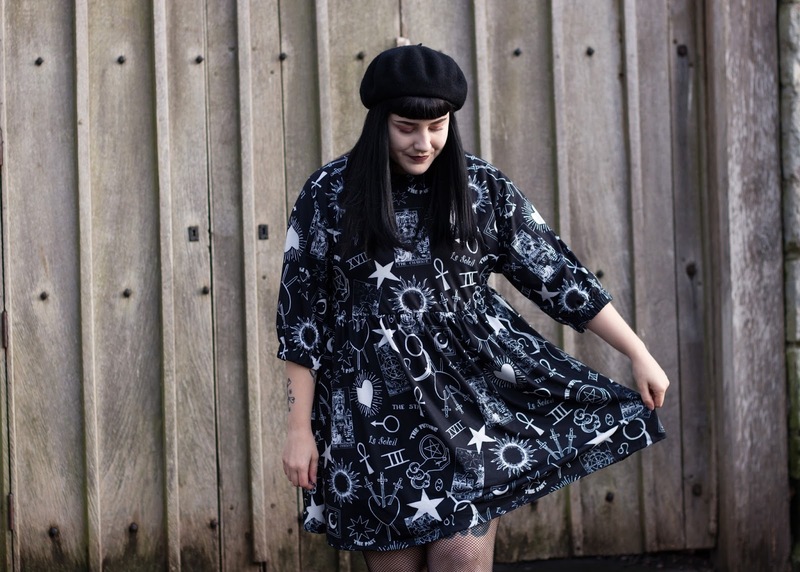 I've paired it with my fave Dr Martens Jadon boots and a fab beret! 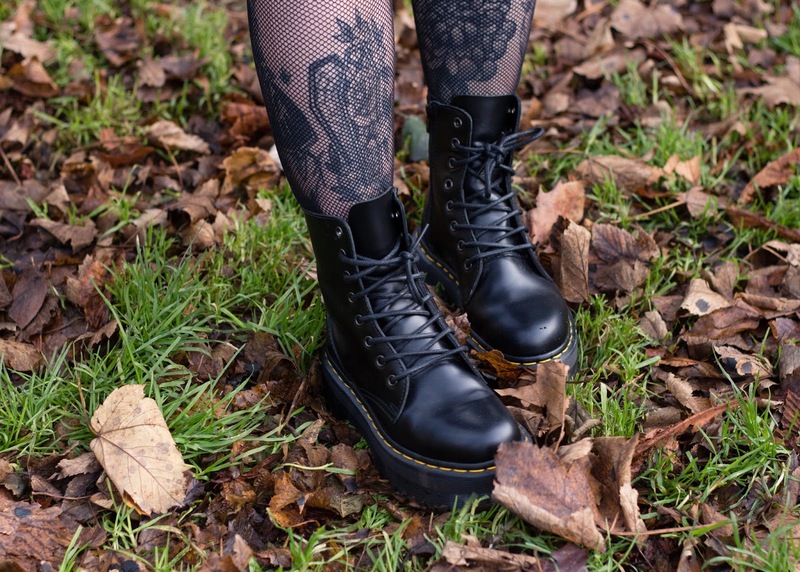 I slightly apologise for featuring both of these in a lot of posts but my roots are in need of some TLC and with the cold weather being in full swing my Docs come in handy as my feet will be forever warm! Great post! It's hard not to feel like you have to explain things sometimes, but you're completely right that we don't owe anyone an explanation. 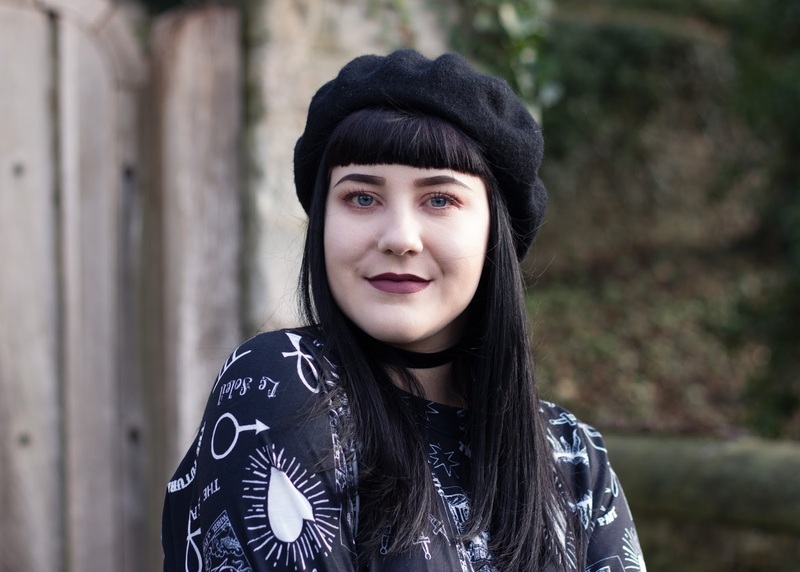 I used to share a lot, but following three bereavements over the past year I really struggled with my mental health and it was really hard to not feel like I had to apologise and explain that to start with, as silly as that sounds! 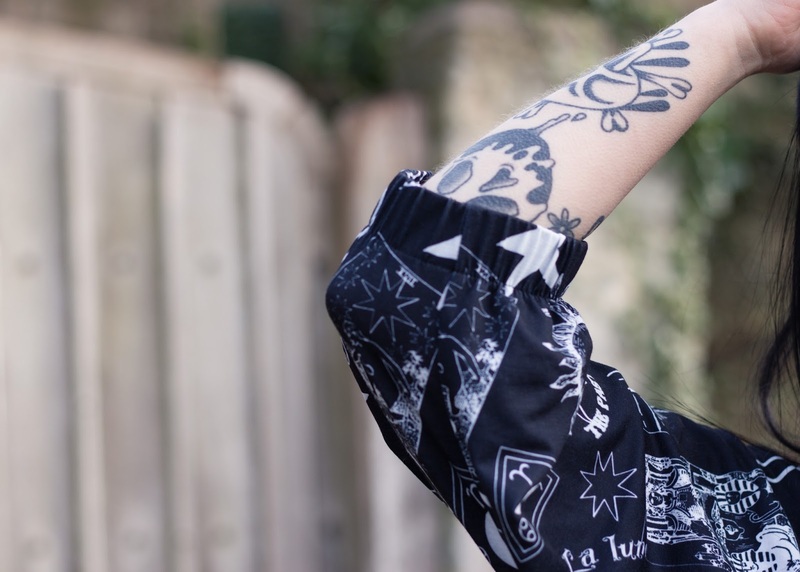 Living for your outfit in this post btw!